We are right in the middle of the summer which means many of you are going on vacation! And for many of us, vacation means car rides! Whether it’s a day trip to a museum a few hours away, or 12+ hours to the beach, logging time in the car can present it’s challenges especially in regards to eating. 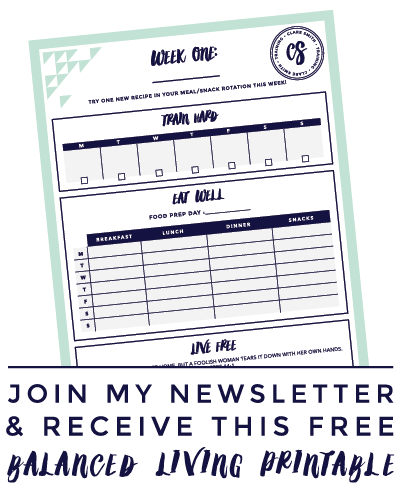 This doesn’t mean that you have to forgo all the hard work and discipline that you have had through the year in regards to your health though! Smart snacking is totally doable! It just takes a little planning! – Decide your goals for vacation/trip. Do you want to throw all caution to the wind? Would you like to keep your normal routine? Maybe mix it up with some indulgences and your normal? I’ve found that defining this goal at the beginning of vacation keeps me on track. It’s not for me to decide what you should do! Just remember that just because you are on vacation doesn’t mean that your calories are! Personally, I indulge a little bit but try to keep in line as much as possible. – Try to get a workout (even if it’s a quick one) the morning before you leave in the car, or once you hit your destination. All that sitting can take a toll on a body that’s used to moving! If you can’t get one in, then use your restroom stops to stretch, do some jumping jacks and push-ups, just to get the blood flowing! Plus, I just feel like it sets the tone for the trip! – My general rule of thumb? When you can eat well, do it. When you can’t, do the best you can. My family just took a trip to DC/Maryland, so here is a glimpse into what I packed! First of all–get a travel cooler bag! I bought this cute one at the grocery store for $6.99 before we left town. There are smaller and bigger ones, so get what works for your family. I like these smaller bags as the coolers (which I’ve travelled with before) take up so much room and are never convenient to get into! And of course–lots and lots of water! It’s easy to make up your calories with drinks on trips, so try and keep a water bottle with you at all times! I have 2 kids, ages 6 and 4, so I have to keep them in mind too. They do eat some of what I do, but of course, want things like fruit snacks and graham crackers! I add a few things in especially for them as a treat for our trip! Keep in mind the refrigeration once you hit your destination. I went a little overboard on what I packed and didn’t have the appropriate way to keep it cold so ended up throwing a lot away. 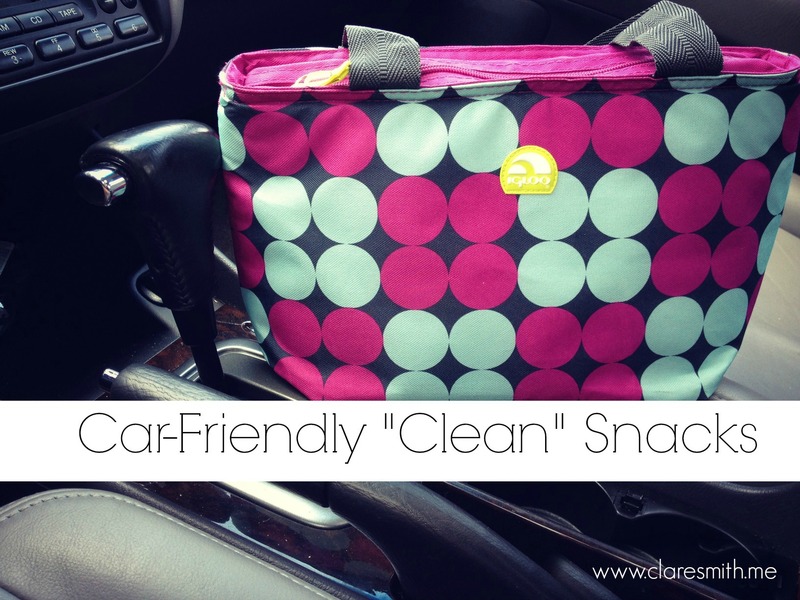 🙁 And in case you are wondering–YES–I do throw in some guilty pleasure driving snacks for trips! (Twizzlers..Peanut M&M’s, anyone??) I just have to take caution with these as I will end up binging on them due to car boredom! P.S. Don’t forget to pack plastic silverware, a bag for disposing trash while in the car, and napkins/wet wipes! One of our favourite snacks to pack is (are?) Blueberry Hippy Muffins (http://twostepsonestep.blogspot.ca/2011/07/hippie-blueberry-muffins.html) I hope it is okay I shared the link? One of my favorite snacks whether its for traveling or every day would have to be rice cakes, with almond butter, and banana slices on top. Yum! I pack the above, but we also pack pretzels and jerky. I make energy bites (like nutrient dense raw cookie dough deliciousness). The girls and I will make trail mix. 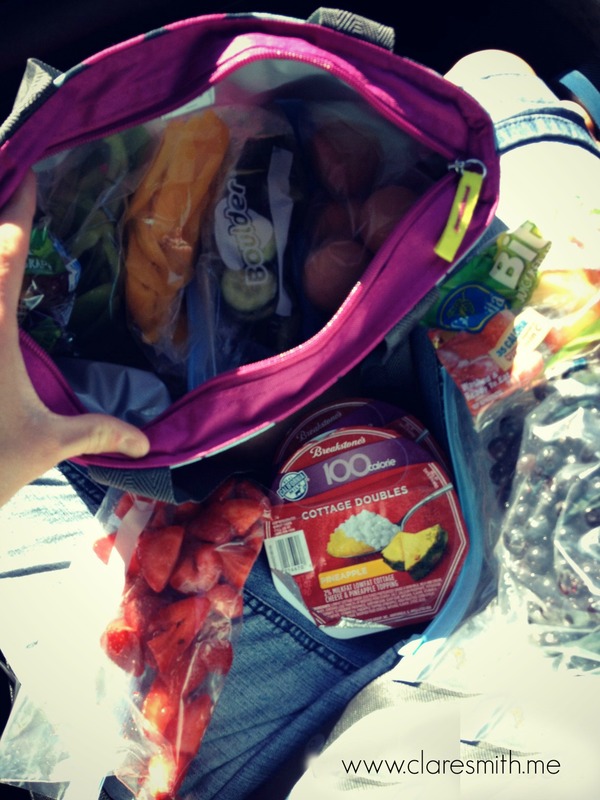 We will pack stuff to make wraps on the go (hummus, lunch meats, cut up lettuce in a baggie). I have also been known to bring along a couple of whole bananas, peel them in the car and make “banana sushi” (put peanut butter on whole wheat tortilla, roll a banana in it, and then slice like sushi). I also make them “mileage bracelets” since we drive for 13 hours. Every 25 miles they got a cheerio and every hundred miles either a fruity whole grain cereal or a sugar free Life Saver (depends on what year we are talking about!) We would string these bracelets before the trip and they put them on in the car. That way they would know when we were getting closer and we would not be asked “are we there yet?” Not in their younger years, but in their older years now (8,9) I pack toothpicks and let them create art with their grapes before they eat them. They make all kinds of neat shapes or animals. Keeps them busy and helps the snacks last longer. We also indulge in the licorice, but we get the rope kind and they also get to create designs with it while they snack. Lots of playing with food allowed in the car! Talking about yeast over growth in our body’s making us tired. Am talking about or has had this problem? I sure think I do. What you need to research is the Ultimate Candida Diet and the symptoms that cause Candida. The spit test is no very accurate but the symptom checker will blow your mind away. I have been on this diet(it’s a huge life change) and so far have lost 90 lbs and my energy level is huge!!! The timing on this post couldn’t be more perfect! My BFF just asked me the other day for some on the go snack ideas or make and take recipes that she could tote along to long swim meets, soccer practice etc. Last weekend, she found herself having to buy her hungry daughter a plain white bagel and cream cheese just to get them through the morning until they could get home for lunch! I’m a newly certified Dr. Sears LEAN (Health and Wellness)Coach (hope that’s ok to mention) and I was able to share a few of our suggestions. Like many of you, we try to encourage lots of fresh fruits and veggies, and avoid items like fruit snacks and sugary, empty calorie drinks with artificial flavors or colors. It’s very common to see those options at your average sports practice or game. However, the last thing we want for already stressed on the go Moms, or those who are trying to relax on vacation, is for their kids to be all hyped up on sugars and artificial junk, especially when they are stuck for hours together in the car, or then having to deal with grouchy and irritable kiddos when they crash from those “foods” or sodas later! Ugh. As a Wellness Coach, I also encourage whole grains, rather than white sugar and white flour carbs, so no regular white rice cakes or pretzels. Brown rice or whole grain cakes with nut butter, and/or bananas is definitely delish. I really liked the brown rice Triscuts, but on closer inspection found that the ingredients listed “Torula Yeast” which is one of many sneaky ways that food manufacturers (even supposedly healthy brands) sneak in alternate form-or percentages-of MSG into their products. FDA loopholes make it possible. The average consumer just isn’t aware. I’ve started eating “Mama’s Gone Crackers” brand (gluten free too) which has a variety of flavors and includes nuts and seeds. I like those Nut Thins too. One of our LEAN snacks is very similar to Jaime’s “sushi”, but we spread a little nut butter on the whole wheat/grain tortilla, leave the banana whole, drizzle with a small amount of honey-or sprinkle flax or chia seeds for a less messy. less sweet option-and call it a banana burrito. Great for a power up before a workout, and kids love it. Of course, those mini bell peppers, cukes, baby carrots and celery go great with the protein filled hummus. Unsalted almonds or other nuts are a great source of protein as well,and good fats. Personally, I’m sensitive to the nitrates in most lunch meats, so I try to pack other forms of protein. I found packaged dried chickpeas with sea salt recently, reminded me of cornnuts, but much healthier. Edamame is great too, as are those Quinoa salads. My teen athletes like jerky, but for every day, I find most packaged jerky to be too high in sodium and other ingredients I don’t want. Clare, I liked your idea of toting along hard boiled eggs, how easy is that! If the kids balk at plain cottage cheese, adding a little unsweetened applesauce or diced peaches or pineapple helps. Many summers my family has pulled out our dehydrator and made our own dried fruits/fruit chips and fruit leather. Throw into ready to go small ziplocs, or mix with nuts for homemade trail mix. Dried fruits are handy, but some packaged brands can be high in sugars. A fellow coach told me that her Costco just started carrying some banana chips that don’t have added sugars. I agree with Francie, most packaged, and some homemade, granola bars (except Lara bars) have much more added sugars than I’d like, so I’m anxious to try yours. I’m with you ladies however on having a few guilty pleasures like Red Vines or Peanut M& M’s, it’s vacation after all! 🙂 If we’re traveling down the (west)coast I can’t resist salt water taffy! My newest addiction though is Brookharts’ chocolate covered Acai berries or Pomegranate-mmmm. Warning, it’s way too easy to eat more than one portion at a time! We like apple wedges and nut butter. Many great ideas here. Bananas are our favorite. Peanut butter and bread or crackers. Cinnamon almonds and other nuts. ivlive celery which also goes well with peanutbutter. Water…water…water. When we take trips to Colorado during Christmas to ski, I like to pack spicy pretzels (good because the “heat” on them keeps you from eating too much) and cuties. Its nice to pack the cuties in ziplock bags so you can put the peal in it when your done.